One of my loyal followers (my sister) recently suggested I do more "vibrant" art. Because, she really likes it (baby sister - of course). 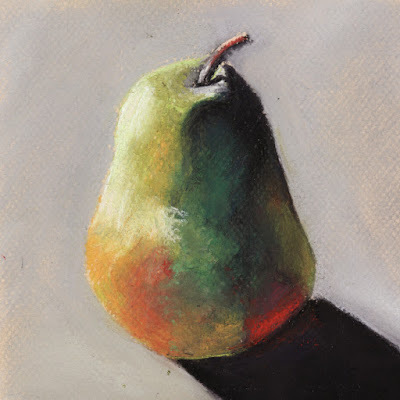 : ) This very vibrant pear was a tutorial by a gifted pastel artist, Ria Hills. Her work oozes rich color and I so admire it. Her lesson on pushing color for this pear was helpful and I love the way the finished fruit grabs you by the collar and shouts, "Are you looking at me?" : ) Good suggestion Sis!